Dr. Adam Doering will present his research project in Fukushima coastal communities where people face to contaminated seas. His team is working on ethnographic interviews, field notes and filming on lifestyle sport and sport tourism. 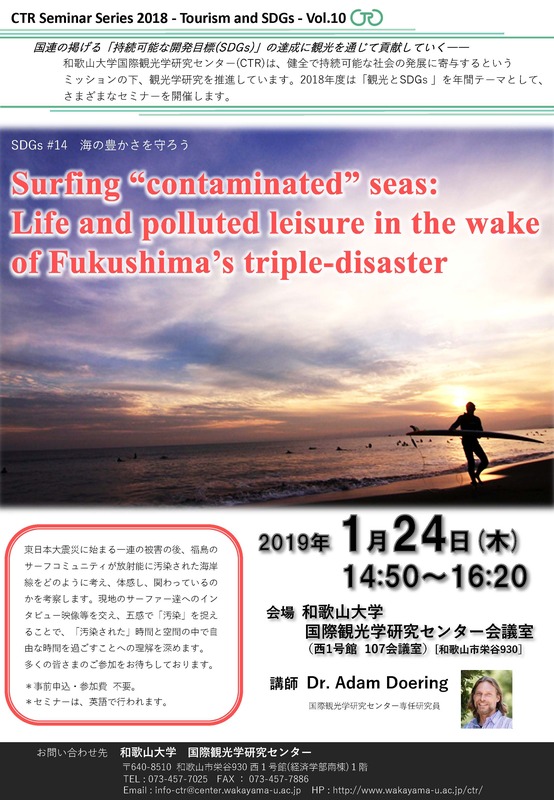 This seminar examines how the local surf community in Fukushima deliberate, experience and (re)engage with a contaminated coastline through their leisure practices in post-disaster seascapes. To give texture to the multiple sensory materialities of “pollution” the presentation is accompanied by a collection of short videos produced through fieldwork by our interdisciplinary research team. In doing so the study strives to broaden understandings of doing leisure in increasingly “polluted” times and spaces.